Blockchain. What is it? Can it be used in education? I gave a detailed account of this at OEB in Berlin and even got married on Blockchain last year, but here's some background to that talk. In 2001 I designed and implemented a Napster-like system in education, the first P2P file sharing system across a network. Remember that tools you use today benefitted from this movement. Skype, the first P2P VOIP software caused massive disruption in the Massive Disruption of telecommunication Industry. We then used the Gnutella, the first ever, open-source, decentralised file sharing software. We distributed created learning content across a network of Local Governments in England, for non-competing public sector bodies, with no central storage or control. Everyone who created content could share it. This one piece of technology had the potential to save literally hundreds of millions, spent on duplicated training creation and delivery of courses. It didn’t work because, despite being non-competitors, the public sector organisations just didn’t like innovation and stuck to their institutional silos. They stuck to their old ways – NIH (Not Invented Here) with massive duplication of content and no sharing, which is as true today as it was then. In fact, that company went on to become a major commercial player in the content market, Learning Pool, and I'm still involved as an investor and board member. Blockchain has that same feel, that Napster moment, when a revolutionary piece of technolohy appears, confuses the market, then starts to make steady inroads. In finance MasterCard, BNP Paribas, Visa and J.P. Morgan, invested in blockchain startups and every major finance organization in the world is looking at the technology, with a fearful eye. That’s because it’s a threat to the way they do business and make money. Direct access to cash transactions without government, with fewer institutions and at almost no cost, is quite a threat, Some put the cost savings at as much as $20 billion. It also gives access to the hundreds of millions who do not, at present, have access to banking – the poor, via mobiles. There’s another sector, where it is already having an effect – charities. The Human Rights Foundation, the American Red Cross, Electronic Frontier Foundation and the United Way all accept Bitcoin. Why? It lies outside of the often corrupt government system. It also appeals to their most important donor base – the enlightened, tech-savvy young. The Water Promise received $23,000 in Bitcoin, via Reddit. This could be the new global currency for philanthropy. The music industry has also seen Bitcoin and blockchain enable artists to be paid directly from their fan base. Blockchain could transform governance, the economy, businesses and organisations function. First, it's already here, not only in Bitcoin but in many other services and commodities - badges, credits or qualifications (Doug Belshaw has looked at this and there's an interesting site badgechain here) as has Serge Ravet of ePIC. Technically, blockchain is a distributed database, spread across many computers with no central control. Each ‘block’ is transparent but tamper-proof. Every ‘block' has a timestamp for recording transactions and offers indelible proof of all transactions. Rather than relying on third parties, it's a frictionless method for transacting with others. In normal speak, the basic idea is that you cut out the middleman. There is no central database as everything is distributed, public, synchronised and encrypted. All transations are logged with a time, date and details of transaction - then verified by some very smart maths. Concensus decides and every transaction is public. What it promises is a more efficient, secure and transparent was of handling transactions. This could saves a huge amount of administration, beaurocracy, effort and time. The Internet of things may release its potential. Single educational institutions, groups of educational institutions, national educational bodies, international educational bodies… anyone who wants to securely store badges, credits, qualifications and make available to others, educational data that matters, could consider using blockchain technology. As education becomes more diversified, democratised, decentralised and disintermediated, we still need to maintain reputation, trust in certification and proof of learning. The increased focus on relevance and employability may also push us in this direction, as we also need more transparency. Blockchain could provide just such a system. A massive open, online, secure database. One school, Holburton School, in San Fransisco, a software school that offers project based education as an alternative to college courses, has already used blockchain to store and deliver issued certificates. It’s seen as a measure to stop fake certification. The encryption and 2 factor authentification, is used to create, sign-off and place the certificate into the blockchain database. They still give students paper copies but the DCN is a number that allows authentification by employers. I can see their point as it gives employers the idea that this school certainly knows its stuff on IT. MIT are doing similar things, as are the University of Nocosia. As educational institutions cluster and co-operate, the need for shared repositories of certification and achievement become real. It may be a group of universities, such a Delft, EPFL, Boston, ANU and UBC, who recently formed a codeshare-like agreement on certification. It may be affiliated organisations that form a global alliance. It may be a global group of schools. Whatever the constellation of institutions or bodies, blockchain gives them a cheap, shared, secure resource. Education is curiously nationalistic. Even in the EU it is a devolved issue. But within a nation, there is a great need for a shared approach to the range of credentials that are being produced at all levels in the system; schools, colleges, universities, institutes, examination boards, trade associations, employers and so on. There is a real need for something that sits above them all. That solution could be blockchain technology. The current system of certification is not really fit for purpose. A paper system is subject to loss, even fraud. With an increasingly mobile population of students and workers, a centralised database of credentials and achievements makes sense, whether you’re moving to another educational institution, new job, new country, even a refugee who has no copy of their degree. Some sort of secure, online repository would be helpful. You can see, through this need, why assessment is the first thing that comes to mind for blockchain. At present, it’s a mess, waiting to be cleared up by a smart operator. One player is Sony Global Education, who have a platform, using blockchain, to house assessment scores. They want schools and universities to use the service, so that individuals can share such data with third parties, such as employers, LinkedIn etc. Their aim is to offer a global service. So let’s up the stakes, with a wider initiative around Open badges. Open Badges gather evidence for credentials. What better than a tamper-proof system for the storage of such credentials? If a blockchain system can offer a massive way to deal with authentic accreditation, then the problems of openness, scale and cost for badges disappears. See Doug Belshaw’s blog. To see how open badge chains can be converted to blockchain, see Serge Ravet’s blog. MIT have been using Bitcoin blockchain for certification and have open sourced their code. Interestingly, there’s a number of MOOCs on Blockchain, including htis MOOC on Bitcoin and blockchain, by Princeton University, on Coursera. Despite the carping, people keep on making and taking MOOCs. They are genuinely changing the way education is delivered and acting as a real catalyst for change, forcing Universities into a rethink. Yet the certification issue remains a little vague. Each separate MOOC provider issues certificates. With some imagination the real demand for MOOCs could be boosted by secure certification. This could be agreement among the major MOOC providers. It could even open up MOOC certification for actual degrees. MOOCs are about decentralisation and widening access, so there’s every reason to suppose that they will want to decentralise and increase access to their certification. Always a problem, CPD is difficult to deliver, often fragmented and poorly tracked. Imagine a blockchain system that really does do this within a profession, taking issued CPD data from conference attendance, courses and other forms of learning. Teachers and other professionals could have inputs from trusted providers and be incentivised to do more CPD, if those experiences and learning opportunities were securely stored in a reputable system. Companies deliver huge amounts of training to their employees but storing achievement is not easy. Current Learning Management System and Talent management System technology, SCORM et al, is a bit old and tired. What is needed is a more open but secure system, for use not only internally but by the employee if they leave. Vocational education is now big business as governments around the world recognise the folly of relying too heavily on purely academic institutions to deliver post-school education. In the UK, there will be 3 million apprenticeships, funded through a levy on payroll. It’s a complex business as employers will play a stronger role in their management and delivery. But how do we manage the process and certification? Blockchain is a real possibility, a centralised but neatly distributed national database for the authentification of process and certification. Blockchain could be used for a myriad of learning experiences from different sources. This requires a small transaction model and could be where xAPI comes in handy. It stands for ‘eXperience API' and can be used to gather evidence from micro-learning experiences. It is open source, the natural successor to SCORM and stores data in Learning Record Stores. This seems like a natural route to the use of blockchain. There is also the easy use of micropayments in learning. Traditional financial transactions use expensive third parties, who charge fees. Blockchain allows free transactions between parties. This could open up micropayments for the use of educational resources, courses etc. All in all, it frees up the system, makes it more open and flexible. And who would argue that this is not a good thing? One could argue that this is starting to happen with the advent of technology in learning, through search, Wikipedia, OER. MOOCs, social media. So I’m sure he would have welcomed Blockchain. Decentralize and democratize, finance and, possibly education. Blockchain is a piece of technology. It clearly has applications in the world of learning, at the individual, institutional, group, national and international levels; in all sorts of contexts – schools, colleges, Universities, MOOCs, CPD, corporates, apprenticeships and knowledge bases. Rather than the old hierarchical structures, the technlogy becomes the focus, with trust migrating towards the technology, not the institutions. This really is a disintermediation technology. Traditionally institutions have been the source of trust, Universities, for example, are trusted brands. 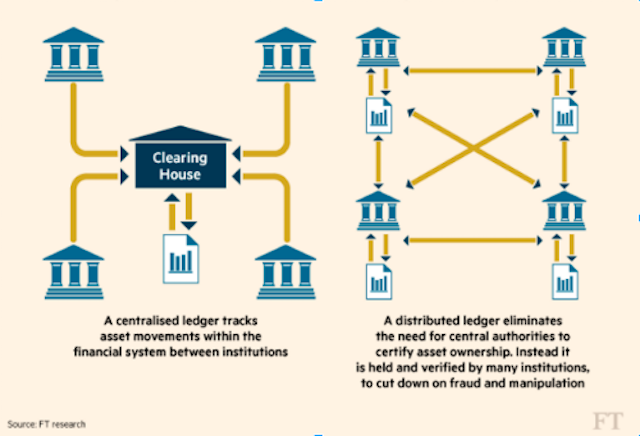 In finance, banks exist to enact the transaction, so blockchain really can disnitermediate. But in education there needs to be trust beyond the technology. We are looking, I think, at a hybrid model, not a wholescale takeover by blockchain. Reputation will still matter and that comes through professional teachers, research reputation and so on. This is not to say that this cannot be done with blockchain, as one could imagine a sort of web of teachers and learners that simply use blockchain to cut out institutions. This, in my view, is not impossible, but it is unlikely. And blockchain is not without its problems. There’s data regulation issues and the fact that $500 million disappeared from one of Bitcoin’s exchanges. The US authorities also had to close down a drug dealing exchange, the Silk Road. But is does merit some serious consideration. Yet the biggest obstacle to its use is cultural. Education is a slow learner and very slow adopter. Despite the obvious advantages, it will be slow to adapt this technology, as most of the funding and culture is centred around the individual institution. Bologna was dead on the day it was signed, as nobody wanted to lose their students and suffer financially. So the source for change will have to come from elsewhere. Then one thing I do know, is that students are doing it for themselves. Check out BEN, the Blockchain Educational Network, a grassroots student-organised movement. This will come from left of field, like Bitcoin. Earl Stevick said it takes 15 +/- 2 years for an educational idea to get into mainstream. A generalisation, of course, but a pretty good yardstick. Unless it's a non-evidenced fad - then it's quick - mindfulness et al.